Sport Management is a growing field that is politically and socially-relevant. For motivated individuals who love sports, exciting opportunities abound in the field of sport management — at the professional, collegiate, and high school or community levels. In Malone’s ACBSP-accredited program, you will learn how to apply excellent business and managerial skills with the demands of what it takes to successfully manage a sports organization — all within a setting that is committed to integrating the Christian faith! You will get hands-on experience in budgeting, marketing, promotions, finance, event management, ethical and legal issues as you work with experts in the field: former professional athletes, athletic directors, and sports information directors, as well as business professors. Our alumni have found fulfilling careers as facility and event managers, sports ministry coordinators, sports management professionals, sports information directors, resort/club managers, and athletics directors. Malone’s location provides students with the opportunity to find internships with professional sports organizations such as the Pro Football Hall of Fame, the Canton Charge, the Akron Rubber Ducks, as well as the professional teams in Cleveland. Internships provide crucial experiences and networking opportunities that may open the door for even bigger opportunities. The course curriculum for the Sport Management program consists of 58 semester hours of business administration, economics, physical education, and sport management courses, as well as an internship. Each course is listed in the official Academic Catalog. Students who are majoring in another program may choose to take a Sport Management minor in addition to their primary course of study. 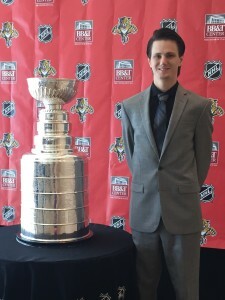 Tyler is the analytics coordinator for the Florida Panthers Hockey Club of the NHL. At Malone, he majored in sport management and business administration while playing for the football team.